NEW ORLEANS — Houston's James Harden dribbled along the perimeter for about 20 seconds while Pelicans guard Elfrid Payton hounded him, even briefly poking the ball away. But as the shot clock wound down, Harden suddenly rose for a 3-pointer and nailed it, eliciting an elongated "ooh" from the New Orleans crowd. "We've gotten used to it," Rockets guard Chris Paul said. "Elfrid is one of my closest friends who I know is an unbelievable competitor and a great defender. But there ain't too much you can do about it." 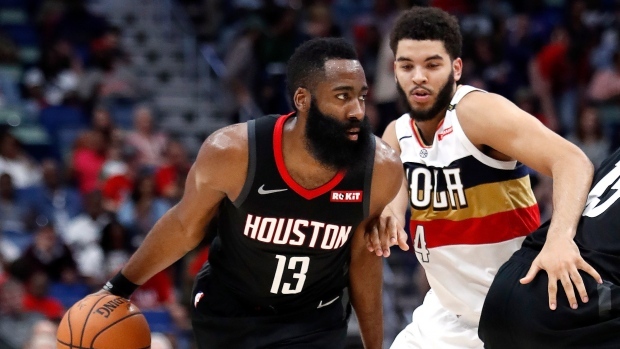 "We were professional tonight from the beginning of the game," Harden said, noting that he appreciated the solid bench play that allowed him some extra rest. "It was great for us. We've had previous games where teams weren't as good, or whatever you want to call it, and we kind of let up and we let one slip. So that was a good job from top to bottom, coming in and playing your role and handling business." Anthony Davis had 12 points and 10 rebounds in just less than 21 minutes for the short-handed Pelicans, who never led and lost for the eighth time in nine games. Frank Jackson scored 19 and Julius Randle 15, but New Orleans fell behind by double digits early and struggled throughout to keep pace with a contending Rockets squad trying to sharpen up for the post-season. "We didn't shoot it to the percentage that we needed to shoot it to stay in the game," Pelicans coach Alvin Gentry said. "Early on, we had turnovers, and one thing you can't do is turn the ball over against this team. It's tough enough as it is guarding Harden." Houston connected on seven 3s in the first quarter alone and the Rockets' lead surpassed 20 points when a driving layup by 2012 New Orleans first-round draft pick Austin Rivers made it 43-22 less than three minutes into the second quarter. "It's something that we always talk about — you know, regardless of the score, we've got to play the right way," Paul said. "We're always trying to build and find little plays or things like that that'll work because you never know when you may need that later in the season." Rockets: Kenneth Faried had 11 points and 11 rebounds for his 13th double-double. ... Gordon checked out less than two minutes into the opening period, appearing to favour his right ankle. He returned with 6:51 to go in the first quarter and wound up playing 21 minutes. ... Six Rockets players scored at least 10 points, including Danuel House Jr. with 14 and P.J. Tucker with 11. ... Houston outrebounded New Orleans 51-44 and shot 48.8 per cent (42 of 86). More than half of the Rockets' field goals (49) were taken from 3-point range, and they scored just 36 points in the paint. Pelicans: Guard Jrue Holiday missed his eighth straight game with a strained abdomen. ... Guard E'Twaun Moore, who has a bruised left quadriceps, also missed his eighth straight game. ... New Orleans shot 41.3 per cent (38 of 92) and went 7 of 28 from 3-point range while scoring 54 points in the paint. .... New Orleans narrowly eclipsed its season low of 88 points in a game. ... Stanley Johnson scored 13 points. While a post-season berth was inevitable for the Rockets, they officially clinched one Sunday night. "We should be in the playoffs," Paul said. "So for us, I guess it's nice that we did that." Three LSU players — centre Kavell Bigby-Williams and guards Tremont Waters and Skyler Mays — waited in a hallway under the stands to greet and take pictures with several Rockets players, including Paul, as they left the building. The Tigers were one day removed from a dramatic victory over Maryland in the second round of the NCAA Tournament.